In our July webcast, Ron Lichtsinn discusses the 2019 Winnebago Forza Diesel Pusher – Watch it here. What floorplans are available in the Winnebago Forza? The Winnebago Forza is available in four floorplans – the 34T, 36G, 38F, and 38W. The Forza 34T comes with dual slideouts, a mid-coach bath, RestEasy Loveseat and BenchMark Dinette make the 34T perfect for couples or small families. The Forza 36G features triple slideouts, lots of interior storage, elegant and spacious living areas highlight the versatile 36G floorplan. The 38W is the newest Forza floorplan offering, choose from a queen or king walkaround bed, enjoy a double sink in the master bathroom, and relax on the TrueComfort+ Sofa. The largest Forza floorplan, the 38W includes two full baths, the bunk bed/wardrobe system, a private master suite, and large living spaces make the 38W ideal for larger families or anyone who enjoys a little extra elbow room. What are the key differences between Class A Gas and Diesel? Power – The Forza has 700-lbs. ft. of torque or power which is 52% more torque than the most powerful gas chassis. Increased power allows for an increased cargo carrying capacity. Ride – In Class A Diesel coaches, like the Forza, the increased power provides a smoother ride for the driver and passengers compared to a Class A Gas motorhome. Sound – In Class A Diesel coaches, like the Forza, the diesel engine is situated in the rear of the coach compared to Class A Gas coaches that have the engine right underneath the cab area. The engine howl in the Class A gas has been decreased in the last few years, but there is a noise compared to the Class A Diesel. 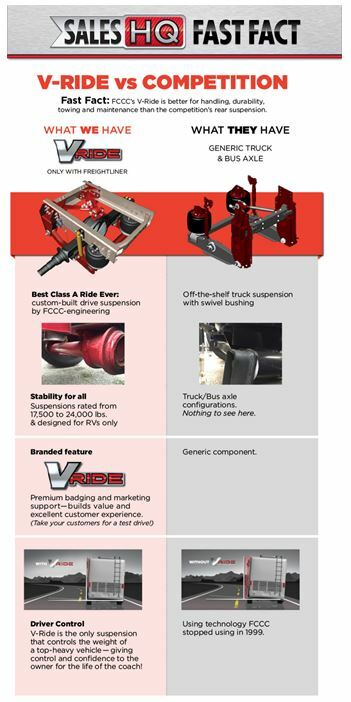 What is the V-Ride and is it available in the Winnebago Forza? Does the Forza have engine brakes or exhaust brakes? The RV industry only utilizes exhaust brakes This braking system actually closes down the exhaust path and it stops the gases from being eliminated on the exhaust pipe. As a result, back-pressure is built in the manifold and in the cylinders, making the engine work backwards and subsequently slowing down the vehicle. What is the suggested engine break-in period for a Diesel motorhome? The suggested engine break-in period includes no towing for first thousand miles and to drive varying speeds in that first thousand miles. This allows for the cylinders to seat themselves in a new power train. This period does differ than how delivery drivers will transport your new Winnebago to your dealer and you can learn more about that here. What is the Winnebago SuperStructure and does the Winnebago Forza have it? 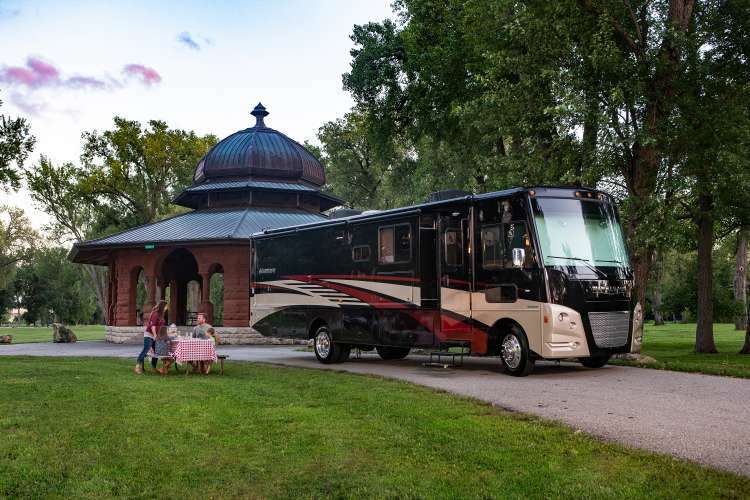 From Winnebago’s smallest Class C all the way up to a Grand Tour, all Winnebago RVs are built to Winnebago’s legendary SuperStructure Construction design. Winnebago’s SuperStructure design includes – interlocking joints, laser cut tubing, a fiberglass roof (with the exception of Intent, Outlook, Porto and Vita), Thermo-Panel sidewalls, embedded steel, structural aluminum framework, and E-Coated steel components. Does the Forza have Freightliner’s New Opti-View Dash? What features in the Forza can’t be powered off batteries? The Forza features a 2,000-watt inverter/charger with a remote panel and a coach battery disconnect system. The inverter works to switch 12-V power off the Forza’s RV batteries to 110-V electrical power. In the Forza, all the outlets and appliances with the exception of the air conditioner, washer, dryer and fireplace are powered off the inverter. What is the warranty on the Winnebago Forza? while some other RV manufacturers, like Tiffin are turning coaches older than 4 years away from their service facilities, Winnebago will be there for you, today, tomorrow and for years to come. The Winnebago Carefree Diesel Living Warranty extends the Winnebago warranty on our diesel pusher lineup — all built on Freightliner chassis — to an industry-leading 3 years or 100,000 miles, whichever comes first. Winnebago has always stood behind its products, and for anyone who is concerned about service, this program clearly demonstrates the confidence we have in our diesel pusher lineup! Lichtsinn RV, America’s closest dealer to Winnebago Industries, has been named Top North American Winnebago Dealer by Winnebago Industries for the last four consecutive years. We proudly sell New RVs manufactured by Winnebago Industries as well as Used RVs. See our Winnebago Forza inventory here. 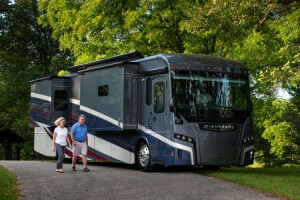 Accessibly priced and loaded with features, the Winnebago Forza is ideal for couples or families looking to step up to the diesel pusher lifestyle, featuring elegant touches like a residential refrigerator, Corian galley countertops, walkaround king bed, and Ultrafabrics Versa swivel cab seats. Designed to take full advantage of Freightliner’s XCS chassis with V ride, the Forza delivers a smooth and well mannered ride while providing 228 cubic feet of exterior storage, so you’ve got plenty of room for all the gear. In short, if you’re looking for diesel performance, space, and refinement while keeping a close eye on the bottom line, take a closer look at the Winnebago Forza. Watch our video on the Forza 38F flooplan here. The Forza is covered by Winnebago’s Carefree Diesel Living warranty program! At Winnebago, innovation isn’t limited to our cutting edge products. We also lead in after sale service support. So while some manufacturers such as Tiffin District Service Centers are turning coaches older than 4 years away from their service facilities, Winnebago will be there for you, today, tomorrow and for years to come. This program extends the Winnebago warranty on our diesel pusher lineup — all built on Freightliner chassis — to an industry-leading 3 years or 100,000 miles, whichever comes first. Winnebago has always stood behind its products, and for anyone who is concerned about service, this program clearly demonstrates the confidence we have in our diesel pusher lineup!